The Capelin is a small pelagic fish and the catch in the Icelandic water is often around 1 million tons per year. The female are larger than the male and also more valuable because of the roe that they carry. The most valuable part of the capelin is the roe(masago). 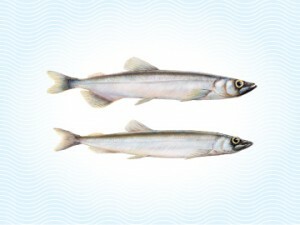 Capelin is rich in omega 3, vitamin b12, vitamin C and high in protein. Capelin is caught using purse seine and midwater trawl. The capelin is pumped on board directly from the net into RSW refrigerated tanks to keep the freshness and improve quality. Then it’s graded and flash frozen whole round.